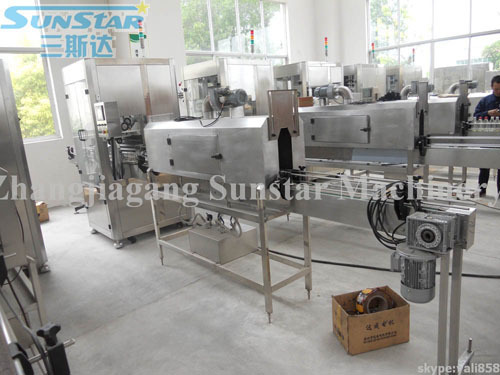 Automatic Shrink Labeling Machine 250BPM---The shrink labeling machine was used for cutting the label and sleeve the label onto bottle body and shrink it by steam. The whole process is automatic and was controlled by PLC. The shrink labeling machine is including steam generator and steam tunnel. 2. Advanced bottle-allocating device instead of the former screw bottle-allocating device. The space between bottles are controlled accurately. No bottle gripped or fall down, milled condition. 4. Auto examination device is applied, if there is no sleeve label signal, the machine will be in semi-sleep condition automatically. Decrease running speed and spoilage, prolong the life of machine. In additional, main electric control element apply SIMENS of Germany. Making the quality more ensured. 5. Large application scope, in effective diameter range, round, square or other abnormity PET, glass bottle etc can be used.